Patrick was off on another research trip to Italy recently and felt inspired to combine these autumnal Italian flavours. He started off in Capri then ate his way slowly up to Florence, Parma and then Venice. However, his culinary heart is in the north, where the food is comforting, nutritious and full of deep flavours. This one is especially perfect for a chilly night after a long day. Buon appetito! Pre-heat your oven to 180 degrees. Peel and finely chop half your red onion and garlic. 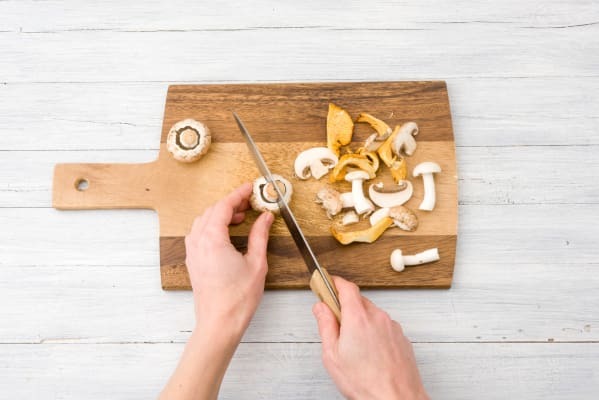 Finely chop your parsley and thinly slice the mushrooms. Boil your kettle and mix half your stock pot with 120ml of boiling water in a jug. Stir to dissolve. 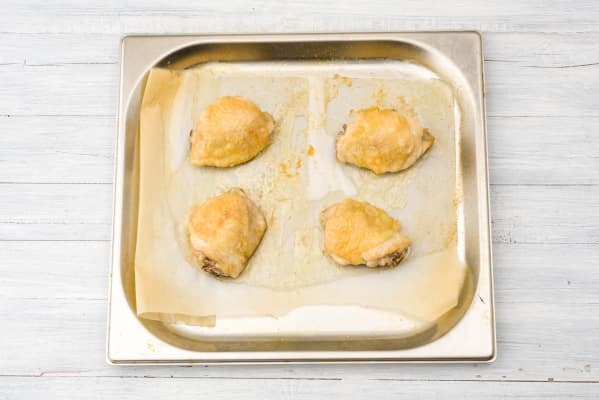 Coat the chicken thighs in 1 tsp of olive oil and place on a baking tray. Sprinkle on some salt and pepper. Cook on the top shelf of the oven for 25 mins. Tip: The chicken is ready when it is no longer pink in the middle. Heat a large frying pan over medium heat and add 1 tbsp of olive oil. Once warm, add the red onion and sweat for 2-3 mins until translucent. 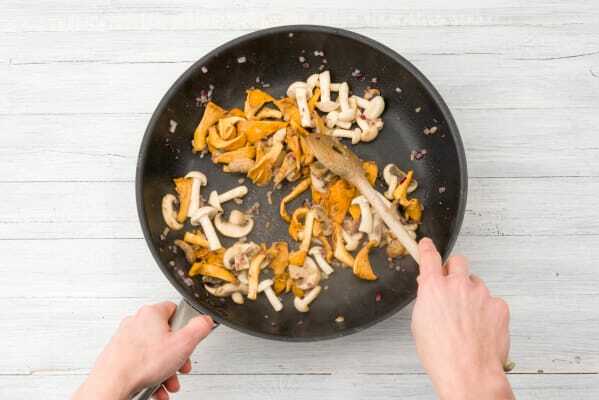 Add the garlic and mushrooms and season with ¼ tsp of salt and lots of black pepper. Cook for a few mins until the mushrooms are cooked through, then turn heat to low. Meanwhile, bring a large pot of water to the boil for the pasta and add ¼ tsp of salt. 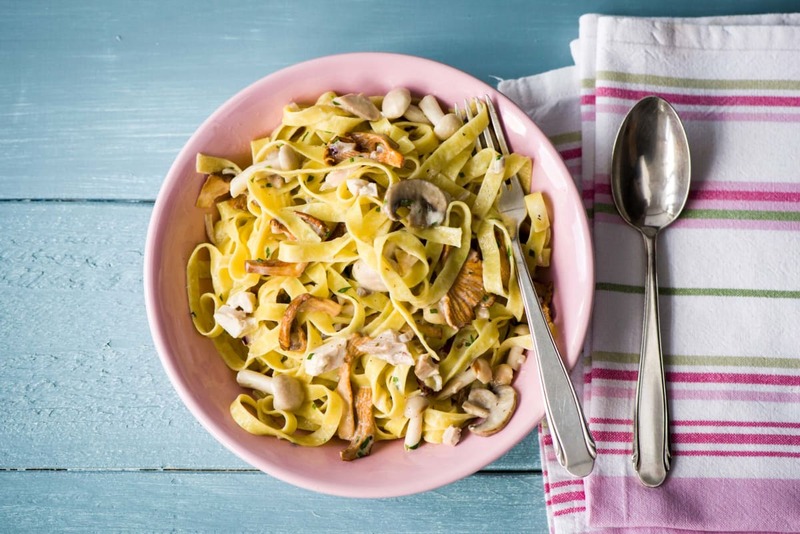 Cook your pasta in the boiling water for around 6 mins or until ‘al dente’. Tip: ‘Al dente’ means the pasta is cooked through but has a hint of firmness left in the middle. 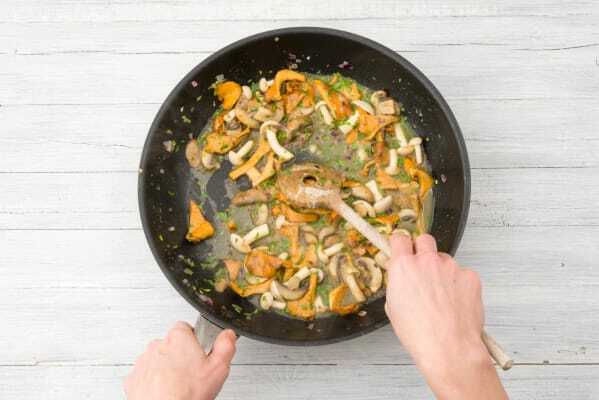 Sprinkle the flour over the mushrooms and stir gently until it has been absorbed. Add the vegetable stock and parsley to the pan. Simmer gently until thickened (about 3 mins). Add a few tbsp of the pasta water to loosen it up. Finish the sauce by stirring in the crème fraîche. Add a good squeeze of lemon juice and a couple more twists of black pepper. Cook gently for 1-2 mins. Drain your pasta then add it to the pan with the sauce. Chop the chicken into tiny pieces and add this too. Serve with a sprinkle of the grated cheese.